Autumn fashion may be associated with sunset coloured leaves, moody hues of grey skies & rainy days, but that doesn’t mean that you need to put the pastels away just yet. I am going to show you how you can style Autumn pastels a few ways that won’t leave you looking like you are dressed for the wrong season! Pastels work great with varying shades of grey. Keep the darker shade on the bottom half, as lighter colours are more flattering against the face. If wearing a blazer, try not to wear the same shade of grey on the bottom half or it will look like you are wearing a suit, especially when worn with dress pants or slacks. It is possible to style Autumn pastels on top of more pastels without looking like you are dressed for Spring. It’s all about contrast. 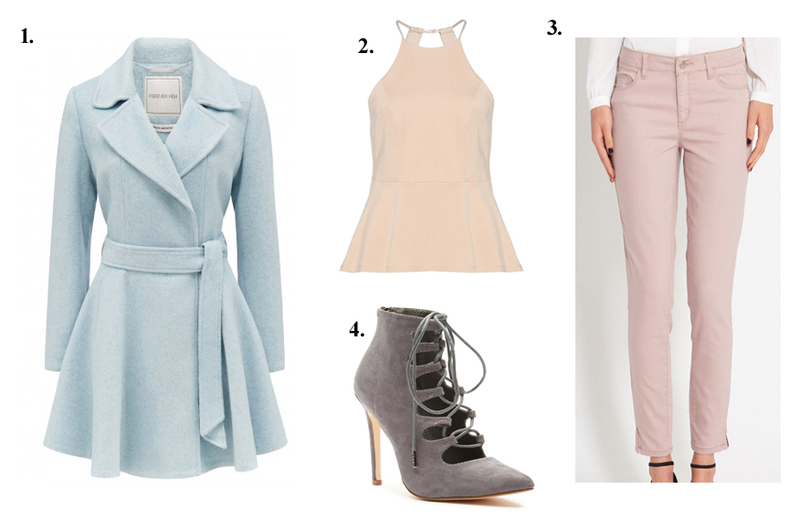 Pair a light blouse or skirt with a pastel hued knit or coat for the perfect feminine ensemble. You could also wear a skirt in a heavier fabric, with a top or cardigan in a lighter fabric. Tip: Break it up a little by adding grey or black shoes and accessories. Would you wear Autumn Pastels? or do you prefer the darker shades during the cooler months? Note: All prices are correct at the time of publishing this post, they are in AUD unless stated otherwise.